It’s been interesting to watch Streaks evolve. 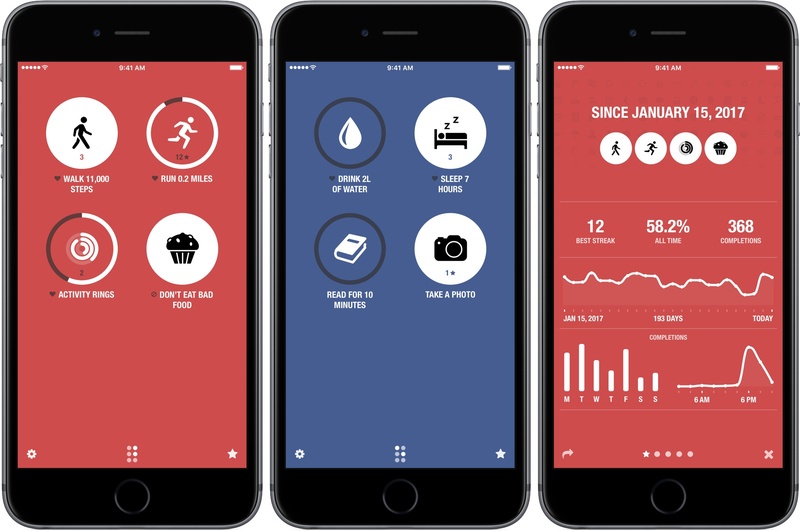 As Streaks has added functionality and customization options with each version, the simplicity of its design has remained the app’s core design principle. 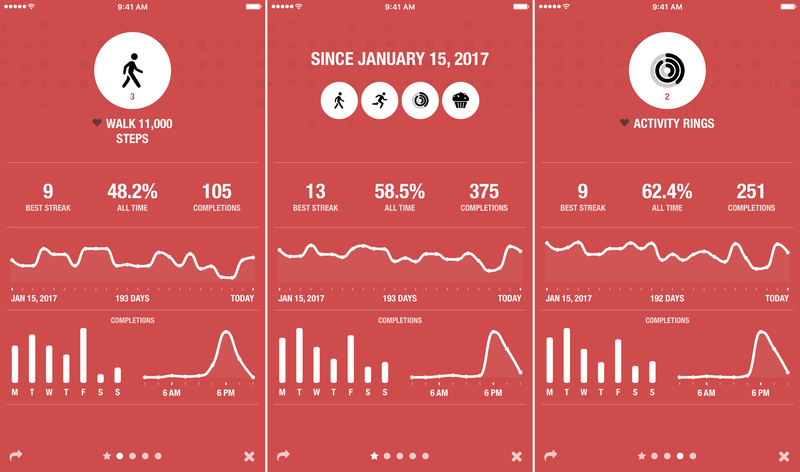 One of the app’s most opinionated design decisions from the start was to limit users to tracking just six goals. Limiting the number of goals was meant to constrain users to an achievable number of goals and helped reduce complexity. When I heard that Streaks was doubling the number of goals that can be tracked and adding in-depth statistics and other customizations, I immediately wondered whether that could be pulled off while maintaining Streaks’ signature design. The answer is a resounding ‘yes.’ Version 3.0 of Streaks not only remains true to its roots, but it’s also the best version of the app yet. When you first open the new version of Streaks, you’re greeted by the familiar interface dominated by up to six circles with icons in the center that represent the goals you’re tracking. Tasks are marked complete by long pressing a goal’s icon. A mini calendar view of your streaks and some basic statistics replace the icon when you tap on a goal. It’s a design that makes it easy to mark tasks as complete day after day without it becoming a chore. The challenge for Streaks’ developer, Crunchy Bagel, was to add more goals without sacrificing Streaks’ uncluttered design, which has been accomplished by turning Streaks’ single view into a card and putting the additional goals on the back. It’s an elegant solution that preserves Streaks’ simplicity at the same time that it opens up interesting new possibilities and makes the app more flexible. If you don’t want to monitor more than the six goals that Streaks has historically let you track, the new goals page can remain hidden on the back of the card interface. However, you now have the option to tap the little six-circle icon at the bottom of the screen to flip the card and reveal up to six additional goals. The flexibility of having more goals is nice, especially if you want to break larger goals like ‘eat healthy’ into smaller goals like ‘eat a healthy breakfast,’ ‘eat a healthy lunch,’ and so on. The button for flipping the card even indicates which goals have been accomplished on the other side in a way that’s similar to the Apple Watch complication. Just as interesting is that the new card interface allows for broad categorization of goals too. Each side of the card can be themed with different colors to distinguish one from the other, which is a nice way to assign each side to a different area of life. For example, one side could include fitness goals and the other, work goals. It’s a small change, but I like that I have the option to split up goals and focus on one set without seeing the other. 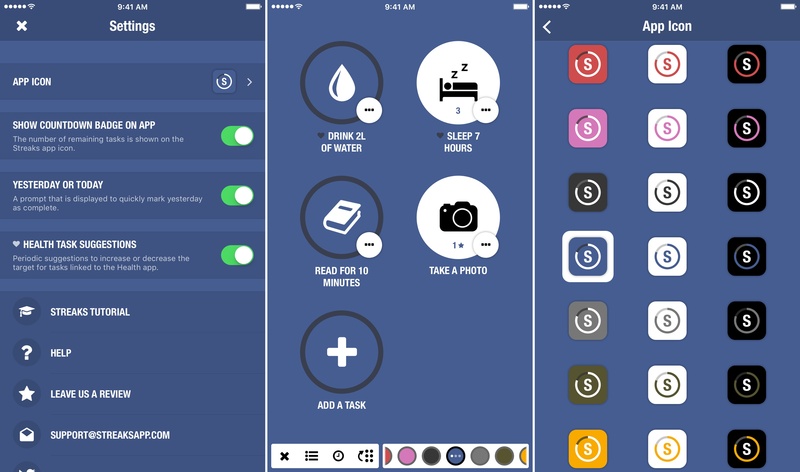 Streaks has also added tracking of negative tasks. Instead of marking tasks as completed, you mark them as missed. If you can make it through the day without doing what you’re trying to stop, your streak will be extended a day. If you slip, log it and the streak is broken. It’s a way of defining the task that fits better with the bad habits you want to break. The time of day you usually complete your tasks. The last two statistics are particularly valuable insights you can consult when deciding when to set reminders for your goals. You can also access a goal's statistics by long pressing its mini chart from the main view. On a Plus-sized iPhone, there is a visual bug that causes the icons for some goals to be displayed a little off center, which is easily resolved with a swipe. However, a permanent fix for the glitch is slated for an update that should be released soon. Notifications have received attention in Streaks' update too. You can set an unlimited number of custom reminders for each goal to help keep yourself on track. Also, the developer says that automatic notifications, which adjust themselves based on patterns in your tracking data, have been improved. Each theme includes a colorful, light, and dark mode. The process of adjusting settings has also received attention in the update. When you tap the gear icon, a two-part settings bar appears along the bottom of Streaks. 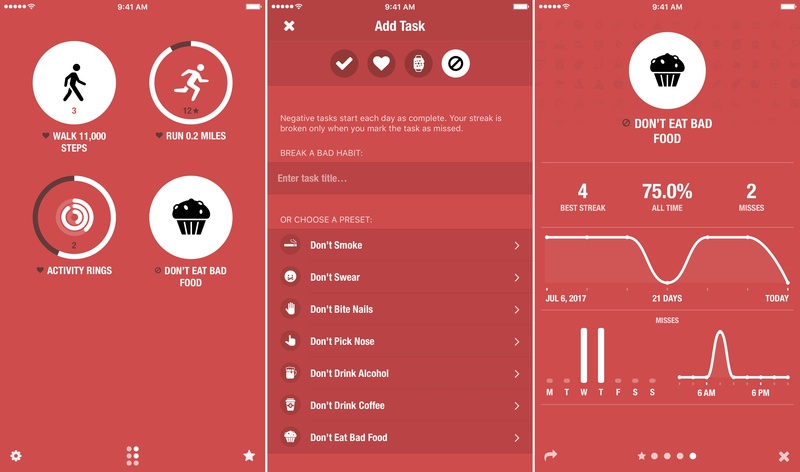 The left segment includes access to general app settings, notifications, and a way to reorder your goals and to change the side of the Streaks card on which they appear. The right-hand segment controls the color theme of each side of the Streaks card. 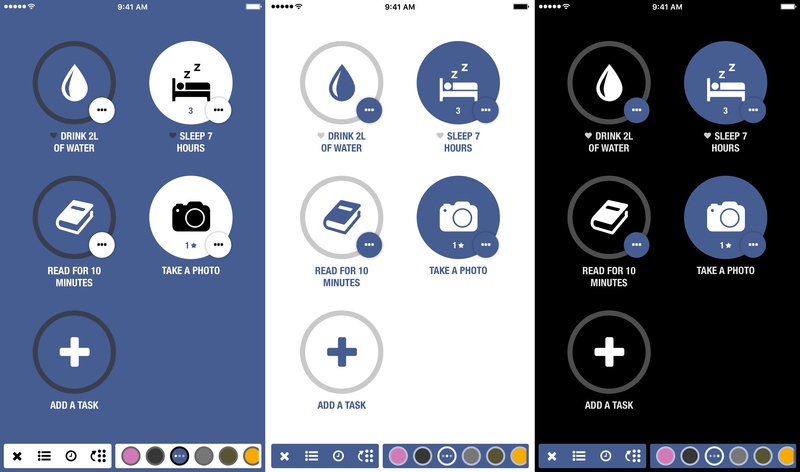 Each time a color is tapped, the app cycles through a colorful, light, and dark version of the theme. It's a nice touch that lets you quickly try different color schemes and see what they will look like without switching back and forth between different screens. There are many other changes to Streaks big and small. One of my favorites is that you can now pick among 45 different app icons for devices running iOS 10.3 and later. There are also new themes based on the Activity ring colors and custom sound effects you can use with reminders or when a task has been completed. General settings, the settings bar, and 45 icon choices. Major updates of popular apps always include an element of risk. Existing users like the app for what it is and making significant changes can alienate them. Streaks 3.0 succeeds by remaining the same app that so many people have downloaded and enjoy, while also adding a remarkable level of customization and many new features. The app accomplishes this by maintaining its familiar, easy-to-use interface and tucking new features away in ways that are accessible in multiple ways but don’t distract from the core experience. I have a few goals I want to accomplish before the end of the year, and Streaks 3 is what I’m going to use to hold myself accountable. Streaks is available on the App Store. Attention Club MacStories members: Be sure to check MacStories Weekly this Friday for a chance to win a free copy of Streaks.